In CoD Black Ops 3, Killstreaks or points are awarded for kills and for success in specific game modes. 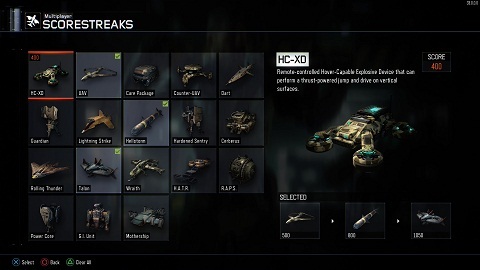 With a killstreak you can unlock new weapons and equipment packages. In Capture the Flag online mode is probably the best example of success in the game modes, here you have to conquer an enemy flag and for that you get a bonus for each flag. Otherwise fill your killstreak bar with kill of enemy players. - The more points you can collect on your killstreak account, the more rewards can be unlocked. - There are Different types of rewards, for example, "inventories" or "counter-UAV", towards the end you could unlock even a heavily armed mothership, a floating battleship. - In each round, you can select up to 3 killstreak goals. But if you get killed, then you lose all your points.